Brigadier General Woodford H. Mabry was born in Jefferson, Texas, on 3 September 1856, the son of a distinguished Confederate officer, Colonel Hinche Parham Mabry. He attended Virginia Military Institute before entering the wholesale business. On 22 January 1891, he was appointed Adjutant General of Texas with the rank of brigadier general, serving in that position until 5 May 1898. Among his many accomplishments as Adjutant General were raising the Frontier Battalion of the Texas Rangers and the Texas Volunteer Guard to a high standard of efficiency, service at the head of two companies of Texas Rangers against the activities of a Mexican revolutionary named Catarino Garza who was operating in Texas against the Mexican government, and preventing mob violence in Woodville, Texas. One of his most significant accomplishments was initiating and securing donations for the purchase of a permanent camping ground for the Texas Volunteer Guard in Austin. Together with the citizens of Austin he was successful and in 1892 the camping ground was named Camp Mabry in his honor by a vote of the companies of the Texas Volunteer Guard. With the outbreak of the Spanish-American War, he resigned his post as Adjutant General on 14 May 1898 and took command, as a colonel, of the 1st Texas Volunteer Infantry. 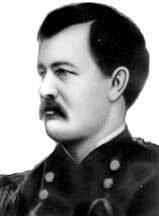 General Mabry died of malaria at Camp Columbia, near Havana, Cuba, on 4 January 1899. The memory of this splendid citizen soldier lives today in the form of the Headquarters of the Texas National Guard located at the post named in his honor, Camp Mabry.